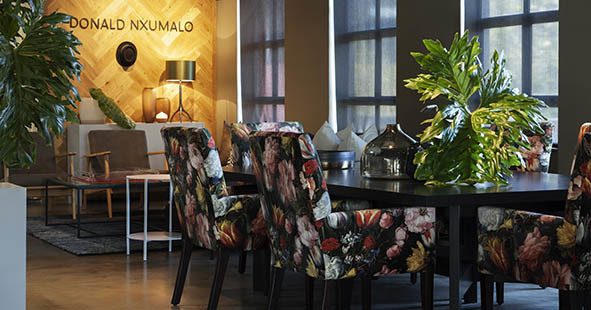 Donald Nxumalo’s future-focused interiors are making a big impact across Africa. They feel effortless. You’ll recognise Nxumalo as the inaugural winner of design reality show ‘Win A Home’ a few years back. For our CoLab feature, in association with Elle Decoration Magazine, he is creating a chic boudoir and sitting area. With the opening of his Kramerville atelier, comes a collection of covetable Donald Nxumalo branded décor and design items. He’s planning to expand this offering with exciting new pieces being revealed on his CoLab feature at the show. This collection will include scented candles and infusers, a luxurious bed linen range, a series of punchy Perspex trays, plus some key furniture pieces in his signature pops of coloured velvet. (All developed in partnership with local suppliers and crafters.) He’s keeping the finer details under wraps so we can’t wait for the big reveal come 25th May!